Every year the dire situation in Palestine seems unsurpassable in a region distinguished by seemingly never-ending conflicts. It is hard to imagine things getting worse and yet they do. The vital issues of Palestine remain unresolved under the dust of the war in Syria, bombings in Yemen, regional rivalries, and changing polarities of global power, while life becomes increasingly difficult for those living in the Occupied Territories and refugee camps. 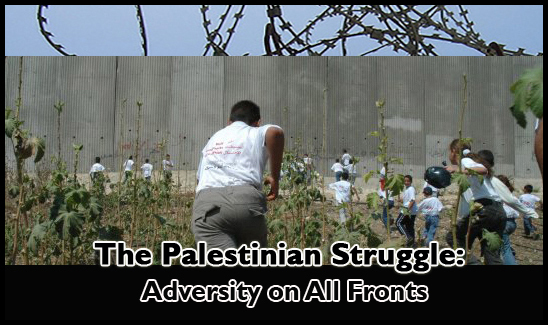 The theme of this year’s Palestine Center Annual Conference returns to these issues. Panelists will discuss the 50-year-old Israeli occupation, coordination of the Palestinian Authority with the occupation, and Israel’s human rights violations. They will examine the continuing problem of representation and media bias when it comes to the Palestinian issue. They will also analyze the status of Jerusalem, situation of Gaza, and persistence of the Boycott, Divestment, and Sanctions movement with its challenges and successes in the United States. Ali Abunimah is co-founder and executive director of the widely acclaimed Electronic Intifada, a nonprofit, independent online publication focusing on Palestine. He is the author of One Country, A Bold Proposal to End the Israeli-Palestinian Impasse and The Battle for Justice in Palestine. He has been an active part of the movement for justice in Palestine for 20 years. Alon Ben-Meir is a professor and Senior Fellow at New York University’s Center for Global Affairs and Senior Fellow at the World Policy Institute. Ben-Meir hosts “Global Leaders: Conversations with Alon Ben-Meir,” a speaking series of debates and conversations with top policy-makers from around the world held each semester at NYU. He writes a weekly article that appears in scores of newspapers, magazines and websites including the Huffington Post, Jerusalem Post, Middle East Times, Times of Israel, Epoch Times, the Political Quarterly, the Harvard Review, and many other publications in Arabic and English. He has authored seven books related to Middle East and is currently working on a new book about the psychological dimension of the Israeli-Palestinian conflict. Dr. Abdel Razzaq Takriti is Associate Professor and the inaugural holder of the Arab-American Educational Foundation Chair in Modern Arab History at the University of Houston. He is the author of the award-winning book Monsoon Revolution: Republicans, Sultans, and Empires in Oman, 1965-1976 (Oxford University Press, 2013, 2016). He is also the co-author and co-curator, with Professor Karma Nabulsi, of the Palestinian Revolution website learnpalestine.politics.ox.ac.uk (Oxford University Department of Politics and International Relations, 2017). Professor Takriti holds a DPhil from St Antony’s College, University of Oxford, and is a Fellow of the Royal Historical Society. Khaled Elgindy is a Fellow in the Center for Middle East Policy at the Brookings Institution. He is the author of the forthcoming book, Blind Spot: America and the Palestinians From Balfour to Obama, due to be published by Brookings Press in 2018. He previously served as an advisor to the Palestinian leadership in Ramallah on permanent status negotiations with Israel from 2004 to 2009, and was a key participant in the Annapolis negotiations held throughout 2008. Prior to that, Elgindy spent nine years in various political and policy-related positions in Washington, D.C., both inside and outside the federal government, including as a professional staff member on the House International Relations Committee in 2002 and as a policy analyst for the U.S. Commission on International Religious Freedom from 2000 to 2002. He served as the political action coordinator for the Arab American Institute from 1998 to 2000 and as Middle East program officer for the National Democratic Institute for International Affairs from 1995 to 1997. Sam Husseini is a DC-based independent journalist who works as the communications director at the Institute for Public Accuracy, a nonprofit group that promotes critical experts and independent sources of information to mainstream and other media. He also founded VotePact.org to help break out of the two-party bind. Dr. Virginia Tilley (MA and PhD in Political Science, U. of Wisconsin-Madison, and MA, Center for Contemporary Arab Studies, Georgetown U.) specializes in the politics of ethnic and racial conflict, with research experience in Israel-Palestine, post-apartheid South Africa, Central America and Oceania (Fiji). Beyond many articles, her published work on the Middle East includes The One State Solution (U of Wisconsin Press, 2005, a pragmatic analysis of the two-state solution in Israel-Palestine); and as editor, Beyond Occupation: Apartheid, Colonialism and International Law in the Occupied Palestinian Territories (Pluto Press, 2012, a co-authored legal study of Israel’s policies in the OPT and their interpretation in international law). In 2017 she co-authored, with Richard Falk, a study commissioned by United Nations ESCWA, Israeli Practices Toward the Palestinians and the Question of Apartheid, which found that Israel is sustaining an apartheid regime throughout territory under its control. Ambassador Feda Abdelhady-Nasser represents the State of Palestine at the Security Council and at the General Assembly and its Main Committees, particularly the Special Political and Decolonization Committee (4th Committee), with specific focus on the issue of UNRWA and the Palestine refugees, a portfolio she has followed for many years. She is responsible for the drafting and negotiation of Palestine’s annual package of General Assembly resolutions. She also often represents Palestine at meetings of the Arab Group, the Non-Aligned Movement (NAM), the Organization of Islamic Cooperation (OIC), the Group of 77 and China, and the Asia-Pacific Group. Among other responsibilities and initiatives during her tenure at the Mission, she was a member of Palestine’s legal team to the International Court of Justice on the case of the wall in the Occupied Palestinian Territory (December 2003 – July 2004). Dr. Lawrence Davidson is Professor Emeritus of History at West Chester University, West Chester, Pennsylvania. He is author of five books including America’s Palestine (2001) and Foreign Policy Inc. (2009). He has also published numerous articles on Palestine, Israel, U.S. foreign policy and other Middle East related subjects. He presently maintains a highly successful blog entitled tothepointanalyses.com. Dr. Sara Roy is a senior research scholar at the Center for Middle Eastern Studies specializing in the Palestinian economy, Palestinian Islamism, and the Israeli-Palestinian conflict. At Harvard University Dr. Roy is also co-chair of the Middle East Seminar, jointly sponsored by the Weatherhead Center for International Affairs and the Center for Middle Eastern Studies, and co-chair of the Middle East Forum at the Center for Middle Eastern Studies. She is the author of The Gaza Strip: The Political Economy of De-development (Institute for Palestine Studies, 1995, 2001, third edition 2016 with a new introduction and afterword); The Gaza Strip Survey (The West Bank Data Base Project, 1986); Failing Peace: Gaza and the Palestinian-Israeli Conflict (Pluto Press, 2007); and editor, The Economics of Middle East Peace: A Reassessment, Research in Middle East Economics, Volume 3 (Middle East Economic Association and JAI Press, 1999). Her most recent book, Hamas and Civil Society in Gaza: Engaging the Islamist Social Sector (Princeton University Press, 2011; 2014, with a new afterword), was a winner of a 2012 British-Kuwait Friendship Society Prize in Middle Eastern Studies and was chosen one of Choice’s Outstanding Academic Titles and one of the Top 25 Academic Books for 2012.